In an effort to improve safety and limit the number of building entry points during the morning M.S./H.S. drop off, LaBrae is making adjustments to our morning drop off locations effective with the 2018-2019 school year. Students can no longer enter the M.S./H.S. at the doors located on the west side of the Complex as permitted in prior years. Effective with the first day of school, the three points of entry for all students will be the main high school entrance, the middle school entrance adjacent to the bus loading zone, and the main Event Entrance. When dropping off your middle school or high school student(s), we are requiring that parents use the driving lane directly along the M.S./H.S. 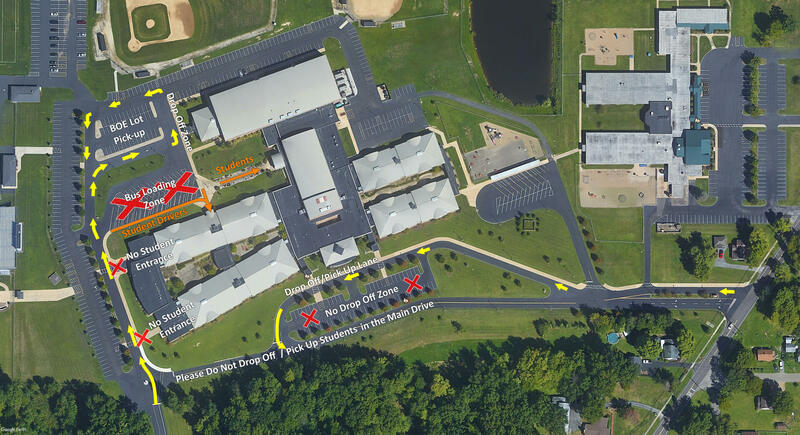 entrance, if you enter the school campus from N. Leavitt, or the newly designated drop-off location in front of the Board of Education Office, if you are entering the school campus from Eagle Creek Dr. Also, all student drivers must use the M.S. entrance or the Event Entrance. The drop off zones will be marked with cones, and we encourage multiple vehicles drop off students at one time in the designated zones. This should help expedite the drop off process and move the traffic through more efficiently. Additionally, students are not to be dropped off in the main drive of the Complex or in the visitor/staff parking lot in front of the high school. Doing so creates an unsafe environment where students then have to cross traffic in the main drive and/or the visitor parking lot in front of the Complex. In order to prevent students from crossing through traffic, we ask that parents do not park along the main drive for student pick up. Parents picking up their M.S./H.S. child are to use the driving lane adjacent to the school, or the parking lot in front of the Board of Education Office, which is directly behind the bus loading zone. Vehicles are prohibited from being in the bus loading zone during student drop-off/pick-up times. It is important to eliminate, as practical as possible, any practices where students have to cross traffic as they enter or exit the building. Therefore, we kindly request that our parents join us in helping to make the morning/afternoon traffic environment at LaBrae a safe place for students. Your cooperation in this matter is greatly appreciated! Please refer to the map below for the designated areas referred to above. If you would like your child’s end-of-the-year report card mailed home, provided all fees are paid, please provide a self-addressed stamped envelope to the middle school main office. Please include your child’s name in the bottom left hand corner on the front of the envelope. Otherwise, report cards can be picked up and fees can be paid in the middle school office from June 5th - 8th from 9:00 – 11:30 a.m. and then again from 12:30 – 2:00 p.m. Beginning June 11th, picking up report cards and paying of fees can be done at the Treasurer’s Office. Have a great summer break!